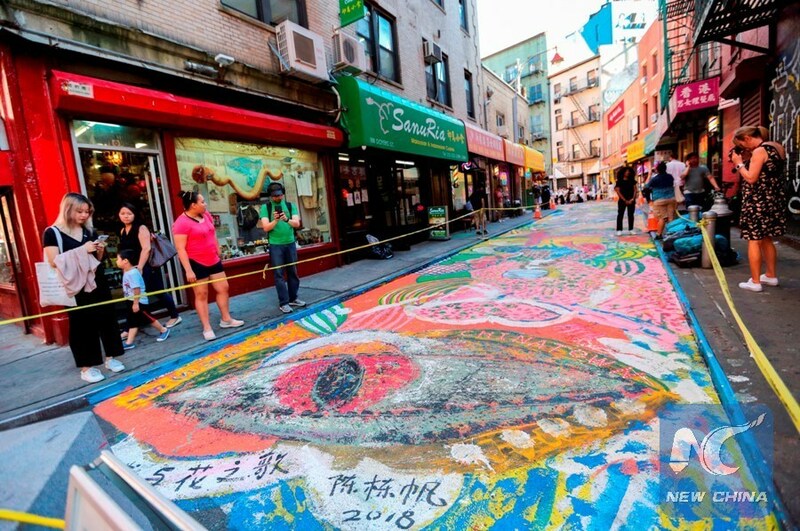 NEW YORK, July 21 (Xinhua) -- One of the oldest streets in Manhattan's Chinatown in New York City got a high-fashion makeover as a Chinese artist painted a grand dragon on it. Located in the heart of Chinatown, Doyers Street was infamously known as the "Bloody Angle" in the early 20th century. With just one block in length and a sharp bend in the middle, the shape of the 200-foot-long (61 meters) street inspired Chen Dongfan, an artist from Hangzhou City in eastern China, to visualize a dragon winding its way up and resting at the intersection with Pell Street. "The Song of Dragons and Flowers" is the name Chen gave to the vibrant painting he installed on the 4,851 square feet (about 450 square meters) with removable and environmentally friendly paint. "This street has a very complicated history. It's where the earliest Chinese immigrants stayed," Chen told Xinhua on Friday afternoon upon the completion of the work. The artist believes that dragon, both from its visual form and cultural meaning, can best represent the area. Instead of depicting the form of dragon on the street, he chose to capture the soul and spirit of this mythical animal, as a visual embodiment of the lasting Chinese cultural heritage, he said. "Chinatown's history is full of hardship, but also full of love. For me, dragon and flower represent love and peace that Chinese people value most," Chen said. "The painting is abstract. At a moment I am not sure what I have painted, yet people living here told me they saw the head of a dragon, the eyes of a dragon, and also flowers. I did capture how they perceived this neighborhood as home," he added. 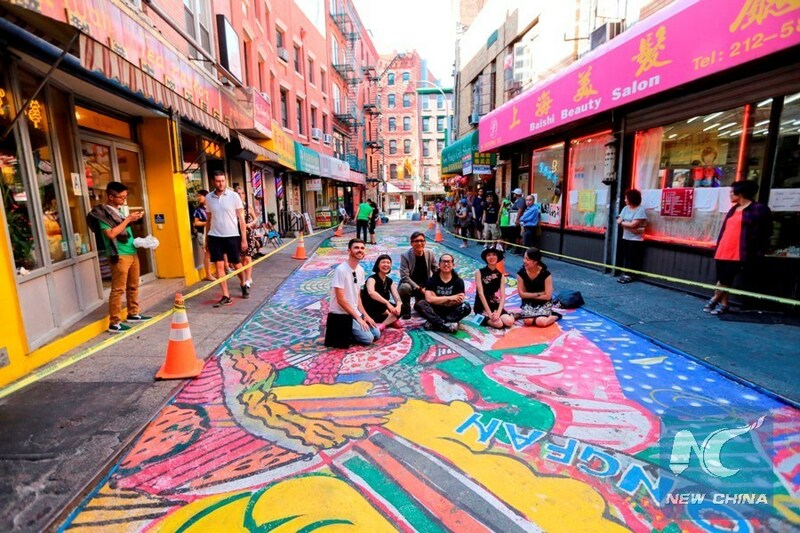 Chen's work is in partnership with Art Bridge and part of the NYC Department of Transportation's Doyers Street Seasonal Street Public Art program, as well as the Chinatown Partnership's pedestrian plaza project. The technicolor painting is part of the organizers' efforts to boost foot traffic to Chinatown, attracting tourists, domestic or foreign, to appreciate the unique culture the Chinatown boasts, Wellington Chen, executive director of the Chinatown Partnership, told Xinhua on Friday. "We wanna show people our history, our culture and what we are proud of," Chen said. "Over the years, this street is less known to outsiders and there are few cars going through it. We did a similar project last year. This year's will be a greater success." Chinatown Partnership was formed in 2006 to bring residents, business owners and community groups together to rebuild Chinatown following 9/11, and to preserve the neighborhood's unique culture while ensuring its vitality in the future through strategic positioning. If Chinatown legendary woman Mabel Lee were alive, she would be very happy to see what this street has become today, Chen said. The post office at 6 Doyers Street will be renamed "Mabel Lee Memorial Post Office," as the U.S. House of Representatives approved the legislation authored by Rep. Nydia M. Velazquez (D-NY) in March, he added. Lee, who died in 1966, was the first Chinese woman to receive a PhD from Columbia University. She is known for organizing classes for Chinatown's residents to build skills in areas like carpentry, radio and typewriting. At just the age of 22, Lee led Chinese and Chinese-American women in a May 1917 pro-suffrage parade in New York City. In addition to the arrival of "The Song of Dragons and Flowers" to Doyers Street, Chinatown residents have another piece of good news to rejoice: a long-closed route from their neighborhood to lower Manhattan finally reopened - 17 years after 9/11. Late last month, New York City's Department of Transportation and the New York Police Department reopened Park Row, a winding path that runs from Worth Street down to City Hall, to cyclists and pedestrians. The half-mile route, which since September 2001 had been used only by emergency and city vehicles, now includes a two-way protected bike lane. "I am happy to see this artwork done. It will attract more people to come. Our business will for sure be better," said Li Jiwei, a barber on Doyers Street.